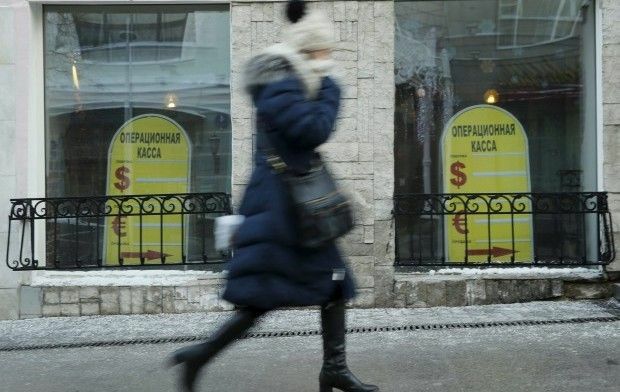 The dollar exchange rate reached RUB 84 to the dollar on the Moscow Stock Exchange for the first time since the denomination in 1998, rising to a maximum of RUB 84.81 to the dollar, which is RUB 3.41 or 4.19% higher than yesterday's closing level, Russian news agency RBC reported. The euro exchange rate also rose more than RUB 3 in the first half hour of trading. The cost of a single European currency reached RUB 92.555 to the euro, which is RUB 3.909 or 4.4% higher than the closing level of the previous trading session. However, the euro has not yet reached its all-time low – on December 16, 2014 the cost of a single European currency rose to RUB 100.74 to the euro. Read alsoRuble at 90 a dollar may trigger interventions: BloombergThe collapse of the ruble is due to falling world oil prices. During today's trading on the ICE stock exchange, March futures for Brent crude fell to $27.54. The Central Bank of the Russian Federation set the official exchange rate for Thursday, January 21, at RUB 79.4614 to the dollar, RUB 87.0314 to the euro. In turn, speaking at the Russian forum of entrepreneurs, Russian President Vladimir Putin said optimistically that the depreciation of the ruble would open "additional opportunities" for Russian businessmen.